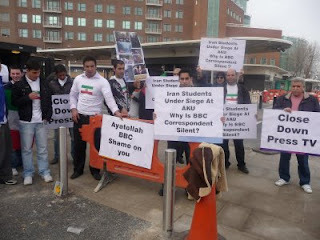 Iranian ex-pats today staged a demo outside the BBC TV studios in Wood Lane, London and protested against the lack of coverage of recent events at Tehran Polytechnic by the BBC correspondent in Tehran. Demonstrators also stood at the main entrance gates of both buildings in Wood Lane and handed out leaflets shown below to the BBC employees as they went through the entrance gates to work. Protesters also refused to leave unless their grievances with BBC coverage of Iran events was registered with the BBC News desk and the BBC Press Officer. At the end, the BBC agreed to allow one representative on behalf of the protesters to enter the building and register their criticisms of the BBC Iran coverage in a face to face meeting with a BBC representative. Only then the protesters agreed to leave the area. In the last week, there have been serious disturbances at Tehran Polytechnic. Hundreds of hired thugs and hoodlums as well as security forces have entered the university campus and clashed with Iran’s pro-democracy students. Nearly one hundred Iranian pro-democracy students from the Polytechnic have been arrested and sent to the notorious Evin prison. Twenty are in hospital as a result of their beatings and inflicted injuries and seven are in critical condition. More dissident students are hiding in the dormitories; the regime’s forces have surrounded the polytechnic but are not entering the dormitories as yet in fear of a recurrence of the student uprising in July 99 that spread to 19 Iranian cities. Yet despite all this happening, the BBC correspondent in Iran has remained silent on the news preferring to report on safer subjects like Iranian women taxi drivers etc. While the plight of Iran’s real students is ignored by the BBC, whenever there is a government sponsored staged demo attacking foreign embassies, for example, the mob is referred to by the BBC as ‘Iranian students’, giving a totally wrong image of who Iran’s real students are to the viewers. So much of the human rights abuse and the struggle of the Iranian people against the theocratic dictatorship is going unreported because the media correspondents fear expulsion from Iran and losing their comfortable posts. As UK TV licence payers we demand better and more objective coverage of the protests and human rights abuses in the Islamic Republic of Iran by the BBC. This is vitally important especially now that the Islamic Republic funded Press TV is operating in UK and is brainwashing the English speaking Muslim audience with their misinformation party-line broadcasting. Good job! I wish you could post a few more photos though. Glad you're doing this in UK. Ayatollah BBC is a shameless pro-Iranian regime entity and they've sided with the Mullahs numerous times. You know, we don't have that kind of an active Iranian community in the U.S. It must be nice. But the Iranian Lobby (headed by your best pal Trita Parsi:)) is getting stronger and stronger. I mean, they're having workshops and fundraisers all over the U.S. They even raised half a million dollars for Obama's campaign, which means they have a voice in this administration - unlike Bush's. But about this thread: I'm very familiar with BBC coverage, and judging from their reporting on American issues, they are a very respectable organization compared to CNN, FOX News, SKY or MSNBC. But there coverage inside Iran clearly falls short. Don't you think it's because if they act as if they have a free hand and cover whatever they please, they would just have there press credentials revoked and kicked out of the country??? One note though: their leaflet statement is sounds so amateurish - don't we have writers who can craft more eloquent rhetoric in the pro-democracy movement? Well done Potkin - good work all round. Sorry I couldn't be there today. Long live solidarity with Iranian students against the clerical bigots and thugs. since when did a handful of people become a movement? there are not many protesters in the picture posted. its silly to call such a group as movement. such movements does exist but its passive and in addition afraid of the iranian intelligence (which is among the most powerful in the world) so im guessing thats why there are few and scarce protests against the regime. if there are any the numbers of protestors are few like in this case. i dont have the guts to protest against this regime thats for sure or reveal anything. Well done Potkin! The protest worked out well, given that two thousand Tamil protestors gathered and still couldn't get a meeting with the BBC press representative; whereas you managed to pull it off. And on a Sunday!